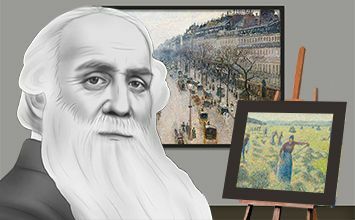 The only painter to exhibit in all eight Impressionist exhibitions organized between 1874 and 1886, Camille Pissarro became a pivotal artist and mentor within the movement. While the Impressionists are known for their depictions of city streets and country leisure, Pissarro covered his canvases with images of the day-to-day life of French peasants. His greatest work joins his fascination with rural subject matter with the empirical study of nature under different conditions of light and atmosphere, deriving from intense study of French Realism. Like those of his Impressionist cohorts, his paintings are delicate studies of the effect of light on color in nature. However, he continually sought out younger, progressive artists as colleagues, and his articulation of scientific color theory in his later work would prove indispensable for the following generation of avant-garde painters. Pissarro's earliest artistic studies were carried out in Paris, France, and Caracas, Venezuela. In Paris, his artistic education stressed an empirical Realism that carried through his entire career; in Caracas, he studied nature and peasant life under tropical conditions, focusing on the effects of light on color, which he would help theorize as a key Impressionist theme. Pissarro's art cannot be divorced from his politics. Influenced artistically by the Realist painter Gustave Courbet, Pissarro's paintings dignify the labor of peasants in communal villages, reflecting the socialist-anarchist political leanings that the two artists shared. Pissarro, working closely with the younger Neo-impressionists Georges Seurat and Paul Signac late in his life, was one of the earliest artists to experiment with color harmonies. In his canvases, complementary colors in broken, dashed brushstrokes weave together to heighten the vibrancy of his compositions. In doing so, they visually embed his peasant figures harmoniously into the landscapes to which they belong and which belong to them, communicating a symbolic link to their terrain largely absent from Impressionist painting. Unlike the Impressionists who lived in Paris, Pissarro chose to live most of his life in the French countryside, where he received younger artists interested in studying his techniques. More than any other member of the movement, he is known for the gentle demeanor and passion for experimentation that made him an artistic mentor. His longtime collaboration with the young Cézanne, for example, made him an indispensable influence on 20th-century modernism. Jacob Abraham Camille Pissarro was born to a Jewish-Portuguese family and grew up in St. Thomas in the US Virgin Islands, then the Danish West Indies. 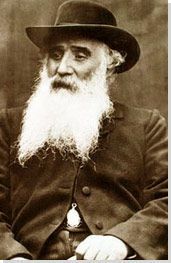 His parents, Frederic Pissarro and Rachel Petit, owned a modest general hardware business and encouraged their four sons to pursue the family trade. In 1842, Pissarro was sent away to a boarding school in Passy near Paris, France, to complete his education. His artistic interests began to emerge thanks to the school's headmaster, Monsieur Savary, who encouraged him to draw directly from nature and to use direct observation in his drawings, empirically rendering each object in its truest form. At age 17, Pissarro returned to St. Thomas to immerse himself in the family business; however, the artist quickly tired of mercantile pursuits and continued to draw ship scenes in his leisure time at the shipping docks. Interactive chart with Camille Pissarro's main influences, and the people and ideas that the artist influenced in turn.